While MBSR is very effective course for learning mindfulness-meditation, some people need private sessions due to frequent travel or scheduling challenges. Individual meditation sessions are intended to help you learn and grow a sustainable mindfulness practice. These hour long sessions explore the foundations of mindfulness-meditation. You are guided through meditations and mindfulness exercises each session and given and home practices. The home practices that you will receive come directly from the MBSR course. You will receive written materials, videos and MP3 guided meditations to support you in the learning process. These sessions will help you develop a regular mindfulness-meditation practice and produce a cumulative positive effect similar to the MBSR course. To gain the most benefit from individual session, a commitment of 8-12 sessions is recommended, however you may use individual sessions as needed to gain insight into coping with specific stressors. 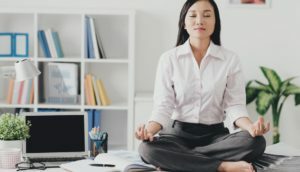 Individual mindfulness session are not therapy, but rather a way of using mindful investigation to deeper awareness, uncover resources, improve creativity, and reduce stress. If you have one or two close friends or relatives that you would like to learn meditation with, small private group sessions can be held for the same fee as the one to one sessions.